A horse sale returned to the schedule during the American Paint Horse Association’s (APHA) recent Fall World Championship Paint Horse Show, held November 3-14 in Fort Worth. The Breeders’ Trust Select Sale was held on November 6th in conjunction with the Association’s second installment of their annual World Show series. All horses consigned to the sale had to be either nominated to the APHA’s Breeders’ Trust incentive program or in foal to a Breeders’ Trust subscribed stallion. Horses were previewed prior to the sale, which was held in the West Sale Arena of Will Rogers Memorial Center. Bruce McCarty of Weatherford, Texas, was the auctioneer while Frank Holmes of Ramah, Colorado, read pedigrees. Of the initial 48 Breeders’ Trust horses consigned, 43 went through the ring while 35 (81%) actually sold. 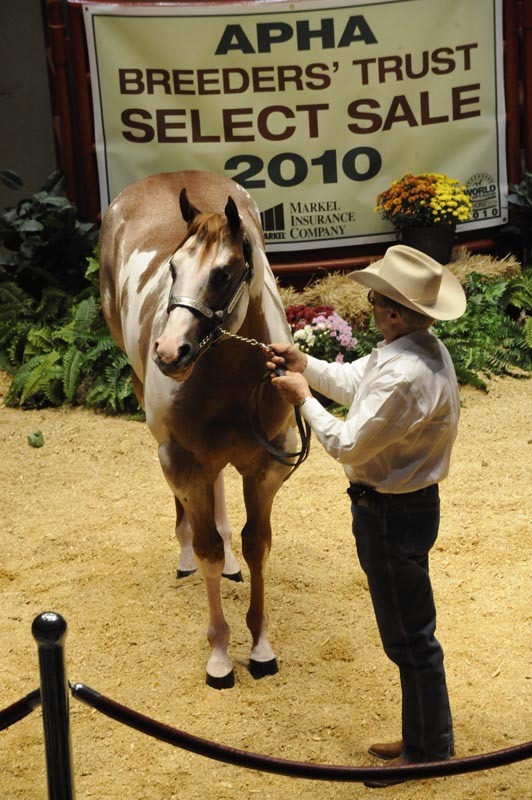 The 2010 APHA Breeders’ Trust Select Sale grossed $130,700 with an average successful bid of $3,734. The high-selling horse was Hip No. 48—Zippos Last Dream. The 13-year-old Quarter Horse mare in foal to APHA Breeders’ Trust stallion Scenic Rio Krymsun was consigned by Richard Estling of Reddick, Florida, and purchased for $17,500 by Spencer & Tina Wooddell of Flemington, West Virginia. The sale catalog and complete sale results can be viewed at aphaworldshow.com/fall/. APHA’s Breeders’ Trust program was created to help offset the cost of showing and to add value to American Paint Horses. The program pays cash dividends for points earned by nominated horses at APHA-approved events, and is designed so that everyone responsible for the success of an outstanding foal is rewarded financially: the stallion subscriber, foal nominator and horse’s owner. In 2009, the APHA Breeders’ Trust program paid out $1,140,086 to Paint Horses with performance records.